Baymen Garden Building A Roof Completed! 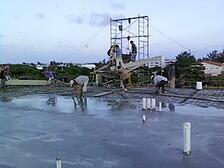 On November 19th, the Building A concrete roof was poured. Several tour groups were visiting Grand Baymen at the time. The first group had a chance to check out the layouts and see the external views from within the building, during the day before the pour. 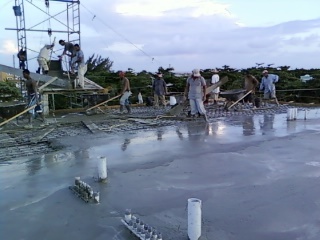 During the second day, the visitors had the chance to watch the floor being poured. Several pictures show the pour in progress, as well as the completed roof. The work started around five in the morning. But it wasn't completed until past 9 PM that night. We couldn't help but notice, since we had friends over for cocktails and appetizers that night. The noise of the grinding cement mixer was unusual for a Saturday evening... It's usually very quiet at Baymen Garden in the evening. After only five months Building A has already been fully enclosed, other than for windows and doors. Concrete is being applied to the external walls this week. And I noticed during our water aerobics class that the roof parapet walls were also being placed this week. There are plenty of workers busy at the site most days. The town must be pleased that our project has kept a good number of construction workers employed during the slow season. Soon the cabinets, windows and doors will arrive. Â I expect to receive the info on upgrade options by mid-December. 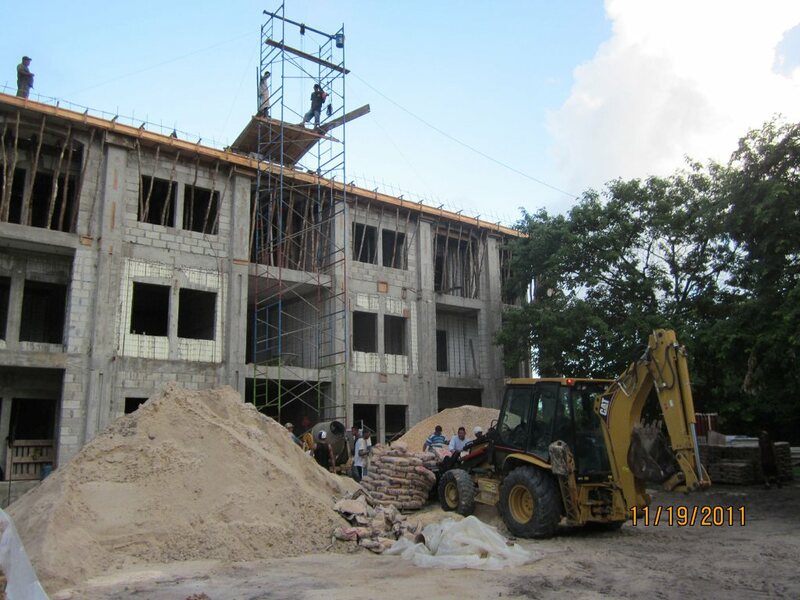 If you happen to be visiting the island of Ambergris Caye, drop by to check out the new Baymen Garden building. It is the only new development walking distance from San Pedro Town. You'll find us two blocks west of the Caye Financial Center and Crazy Canucks beach bar. Due to the construction, the Building A area is cluttered with construction materials.So it is not safe to tour the site without one of the Grand Baymen representatives. If you contact us, we'd be happy to give you a tour. The views of the Bay, over the pool are exceptional. One can now get a sense of how the project will evolve.